Take a look at this! I hope right about now you’re having some serious noodle cravings! 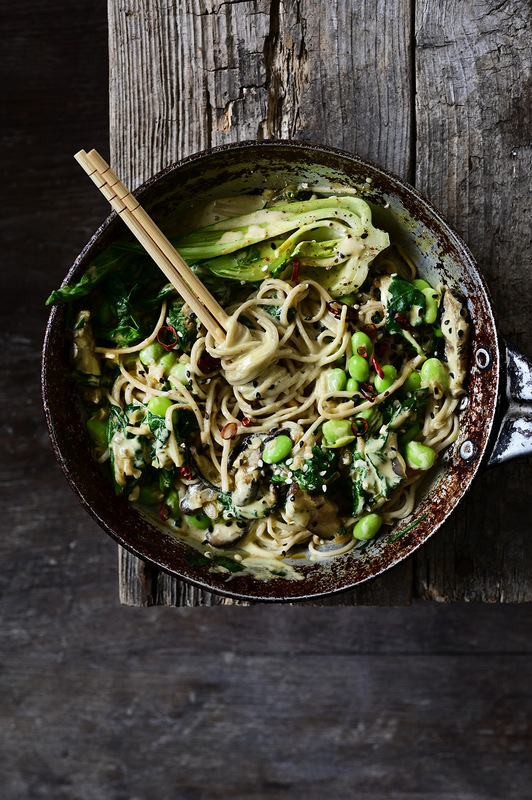 So I’m sharing this recipe with you, so you can easily make these amazing soba noodles with sautéed vegetables and a delicious coconut sauce. Let’s take a closer look at what an abundant goodness I’ve added to the dish and how easy it is to throw together. 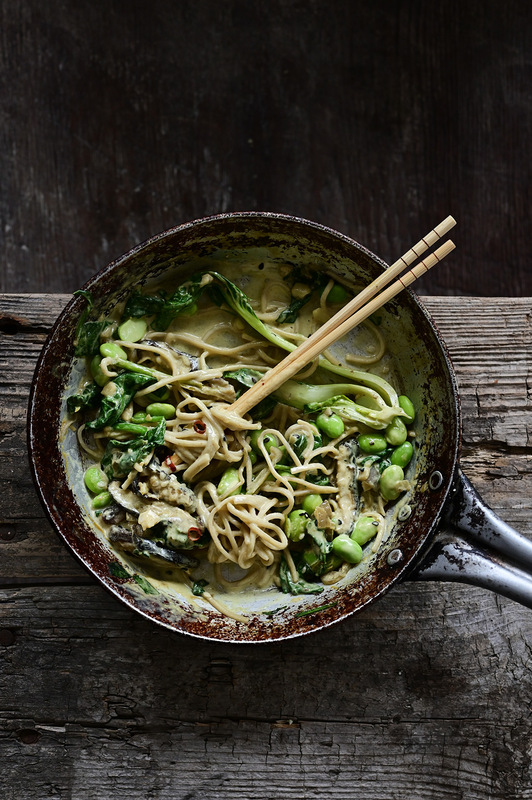 It’s a simple recipe with a lot of veggies like edamame, caramelized shiitake mushrooms, baby pak choi and spinach, all simmered in a silky and fragrant red curry coconut sauce. Today I’ve used soba noodles but any pasta or noodles will do. Feel free to change out the veggies as well, based on your preferences and the season. A fast and healthy weeknight dinner! You’ll have a delicious dish, full of nutrient vegetables on the table in less than 30 minutes. And the leftovers will make for a tasty lunch. Hope you enjoy! Bring a large pot of salted water to a boil for the pasta and cook pasta al dente. Rinse with cold running water and drain. Make the coconut sauce by stirring the ingredients together in a bowl. Heat the coconut oil in a pan, sauté mushrooms until edges are crispy and caramelized. Reduce the heat, add garlic, shallot and ginger, cook until soft. Add pak choi, edamame and spinach and cook until wilted. Pour the coconut sauce and simmer for 5 minutes more. Taste and season with salt and pepper. Combine with soba noodles and serve immediately. Sprinkle with sesame and chili flakes, drizzle with chili oil for a spicy kick. Enjoy! Thank you so much Anna!! Really appreciate the feedback and I’m so happy you like it! Thanks so much, happy you like this!! The flavours and colours in this dish are really lovely. The coconut sauce sounds amazing. I have most of these ingredients in my cupboard so maybe I’ll give it a go myself soon!